Description: The first train of the B&M at Rotterdam Jct BMSE-6A arrives at the west end of Selkirk Yard behind B&M power. 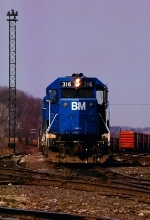 Description: Boston & Maine Operations at Mechanicsville Yard in Mechanicville, NY. Description: Boston & Maine Operations - East Deerfield Yard in East Deerfield, Ma. Description: Three years old and she still looks great, 316 idles between assignments at Lawrence,Mass. Description: SPCP's power heads out to his train in Greenfield, while MELA's power waits to get in. Description: The west end switcher pulls a string out while MELA's power.......STILL waits. Description: Finally, MELA gets the "green light" to enter the yard. 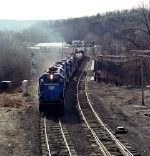 Description: A UBO loaded coal train for the Public Service of New Hampshire geenerating plaant at Bow, NH. departs East Deerfield east, crossing the Connecticut river. The two B&M GP-9's were added at East Deerfield for the added tractive effort needed to surmount Ashburnham Hill between Athol and Fitchburg. Description: CPSP arriving at East Deerfield West via the Fitchburg main. Description: With a large drop at E.Dfld., the train will swap his big lash-up for a smaller one for the remainder of the trip to Springfield. Description: LAPY westbound at "the middle" signal bridge on a track that has since been removed. Wisdom Way overhead visible in the distance. Description: A pair of Maine Central, ex Rock Island U25Bs are part of the power set that brought a Bow coal train to Concord, seen here laying over til the train is empty.